Apple is about to unveil its new Apple Watch Series 4, and it’s going to be the biggest upgrade we’ve seen so far. The new model will have larger OLED displays stuffed into the same size cases, and it’ll be even thinner than previous-generation models. There’s one important area where the Apple Watch Series 4 won’t offer much if any improvement though: battery life. 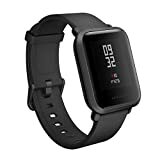 If you want something that blows the Apple Watch out of the water when it comes to battery life, check out the Amazfit Bip Smartwatch by Huami. Instead of getting a day or two in between charges, the Bip lasts for a month before it needs to be recharged!